Our next stop, Yosemite National Park � but please don�t miss the Mobil �Tioga Gas Mart� � not for the gas, but for the food. I kid you not, that but for the extreme rigidity of the rules associated with obtaining a �Michelin Star� � this gas station restaurant would have one. Chef Matt Toomey began with the usual U.S. rest-stop fare (card-board tasting hamburgers) and moved on to requesting a pizza oven � got bored with that and gradually developed a menu rivaled by the most sophisticated cuisine in the country. I had a Sushi-grade tuna, while drinking diet pepsi from a plastic cup (I don�t know the year or the vintage). The Legendary Lobster Taquitos -- three taquitos served on a bed of Brazilian black beans topped with tomatillo pineapple salsa and fresh salsa has been featured in featured in, Gourmet and Sunset Magazine, as has the Herb Crusted Grilled Pork Tenderloin, served with apricot wild berry glaze, garlic mashed potatoes and fresh vegetables. Do plan to eat here, for both the incredible culinary experience, and the fact that you�ll be told that your journey will take you an hour to the entrance of the park � what they forget to tell you is that it�s an additional two-hours from the entrance to the valley floor (where your hotel and all the famous sites are). 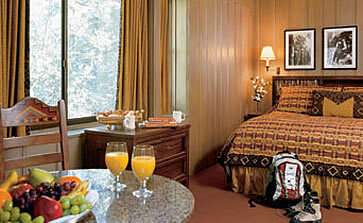 Yosemite is a natural paradise and the Ahwahnee Hotel, an oasis of luxury amidst campgrounds and surrounding lodges. 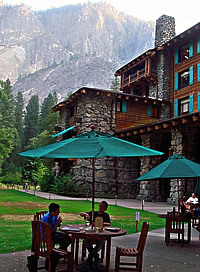 The name of the hotel is derived from the Native American people that inhabited the area years ago who called the Yosemite Valley the �Ahwahnee� or �place of the gaping mouth and referred to themselves as the Ahwahneechee. The hotel was built in 1927, �ancient� by American standards, and the principal goal was to build a luxurious fire-proof structure that would elegantly blend with its natural surroundings. Thus, the principle external structure is of stone, and the rough hewn rafters (with steel I-beam cores) also blend seamlessly with the Sequoia�s and sugar pine that surround it. 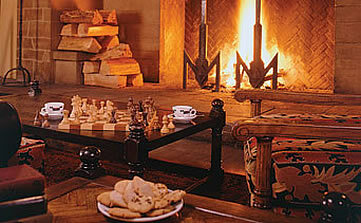 The hotel has been frequented by John F. Kennedy, Queen Elizabeth II of England, Former First Lady Laura Bush, and a slew of actors and actresses. 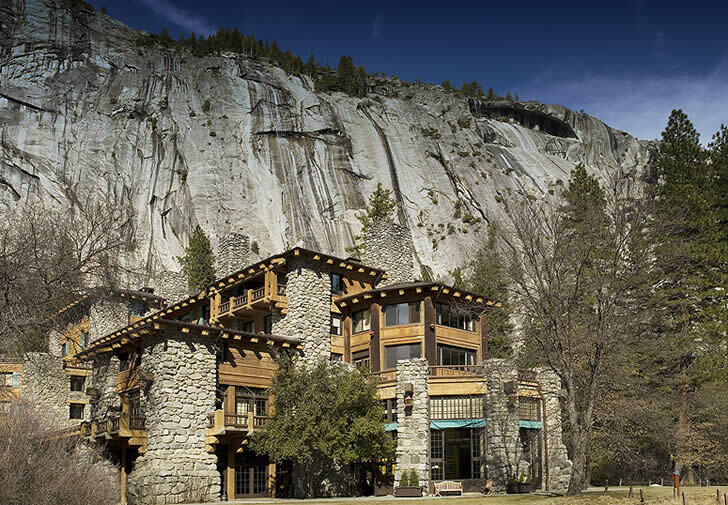 The current manager of the Ahwahnee, Andrew Medley, has his roots deeply imbedded in the Park as his father and mother met as Park Rangers in the Park and his father was a principle editor of a hardcover historical account of the Ahwahnee (available for sale in the gift shop). 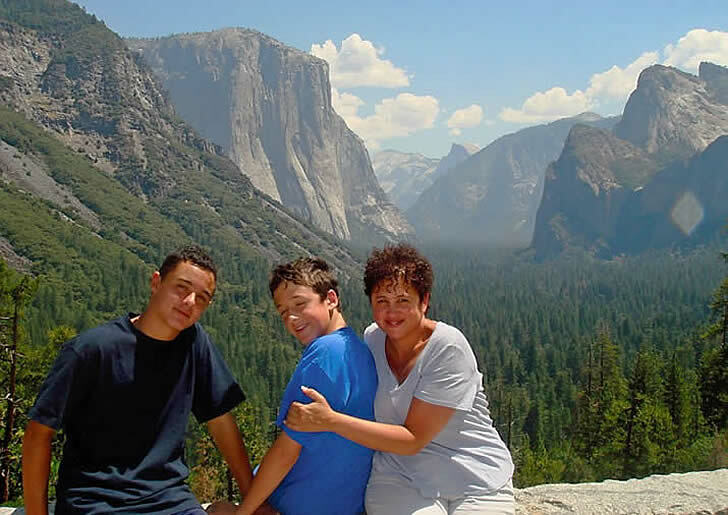 Andrew attended the School of Hotel Administration at Cornell University and returned to the Park when his father died in a car accident on his way to work. Upon his return, he was offered a position as Manager of the Awhanee, thereby continuing the long legacy of affiliation serving the needs of Park guests. 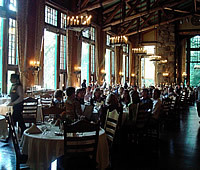 The dining room is massive (about the size of ½ a football field) with 18 foot ceilings from which hang over a dozen triangular-shaped candelabras. We were seated in the alcove at the far end of the dining room, in front of a massive picture window which framed the woods beyond and the moon rose while we ate dinner until it was perfectly situated in the upper right corner of the �painting� outside. That particular table, and in fact, the actual seat in which I sat, with Matthew and Alex to my left and right, was the seat where Queen Elizabeth sat during her visit. We recommend commencing your trip with the �Valley Tour,� an open-air bus, narrated by a guide (not to be confused with the free shuttle bus). 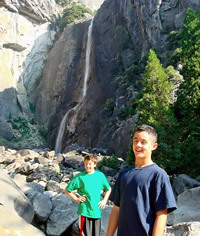 You�ll see the most important sites, including Half Dome, El Capitan, Bridal Veil Falls and Yosemite Falls. While they have been eternally memorialized in the photographs of Ansel Adams, there are no �placards� or other signs on the Valley floor to give you any idea that you are, in fact, looking at what you think you might be looking at. Afterward, return to your favorite sights on your own. We returned to a favorite spot in the Merced River with stunning views of El Capitan. Matthew and I swam in a little water hole, while Alex concentrated his time on catching minnows in a paper cup, something which consumed about two-hours with limited success.